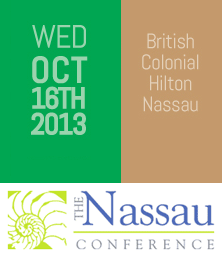 The Association of International Banks and Trust Companies in The Bahamas’ (AIBT) 8th Annual Nassau Conference 2013 is scheduled to be held October 16 at the British Colonial Hilton. “The Nassau Conference is designed to provide the professional service community in The Bahamas with an accessible, world-class learning and networking experience,” said Minister of Financial Services Ryan Pinder. The event will be held under the theme: The shift has occurred. How are you positioned? The Ministry of Financial Services will be a lead sponsor of the event. Pinder said that a “fundamental” component of his Ministry’s sponsorship is the continuing practice of allowing the complimentary attendance of 10 College of The Bahamas (COB) students at the conference, as well as the continuation of a highly competitive, paid summer internship for COB students, who are selected on the basis of the educational achievement and career aspirations. Nassau Conference chairperson and newly elected chairperson of AIBT, Antoinette Russell, confirmed that 30 COB students had registered so far to attend the conference. “The conference participation and the summer internship will expose these students to the financial services industry by providing hands on training and a wealth of knowledge,” Minister Pinder said. This year’s summer internship programme provided an opportunity for 11 COB students to gain such experience and his Ministry expects to expand the internship programme to 20 students in Summer 2014, Minister Pinder noted. Minister Pinder said that as a sponsor of this year’s conference, the government remains committed to opportunities that enhance the human capital and technical skills of financial service sector employees and those seeking to enter the sector. Education Minister Jerome Fitzgerald was in Grand Bahama last week to discuss training at BORCO and the development of the College of The Bahamas' Freeport campus. See larger photos courtesy BIS/Vandyke Hepburn below. Cantor Gaming and Celebrity Cruises announced yesterday that they have entered into an agreement to provide the cruise industry’s first complete mobile casino gaming solution.